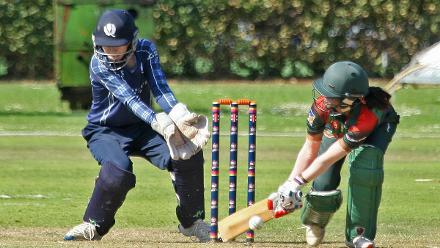 2nd Semi-Final: Bangladesh Women v Scotland Women, ICC Women's World Twenty20 Qualifier at VRA Ground, 12th July 2018. Match referee Jukes with the captains, 2nd Semi-Final: Bangladesh Women v Scotland Women, VRA Ground, 12th July 2018. 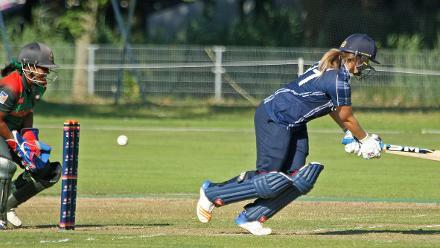 Looking for the coin, 2nd Semi-Final: Bangladesh Women v Scotland Women, VRA Ground, 12th July 2018. 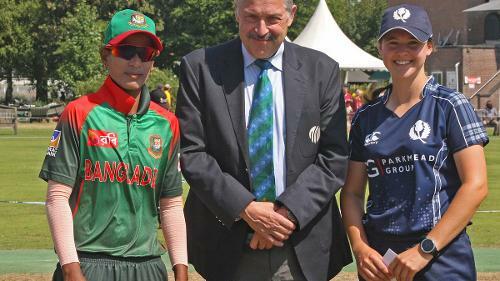 Captains Salma Khatun and Kathryn Bryce, 2nd Semi-Final: Bangladesh Women v Scotland Women, VRA Ground, 12th July 2018. 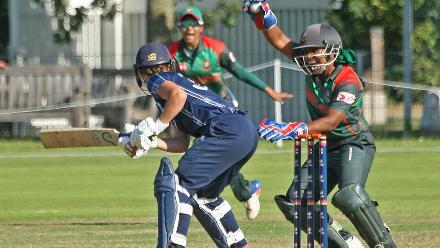 A reverse sweep gone wrong, 2nd Semi-Final: Bangladesh Women v Scotland Women, VRA Ground, 12th July 2018. Fahina Kathun is stumped off Maqsood, 2nd Semi-Final: Bangladesh Women v Scotland Women, VRA Ground, 12th July 2018. 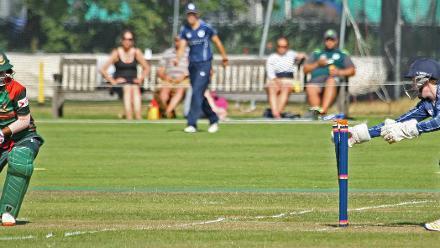 Abtaha Maqsood bowling leggies, 2nd Semi-Final: Bangladesh Women v Scotland Women, VRA Ground, 12th July 2018. 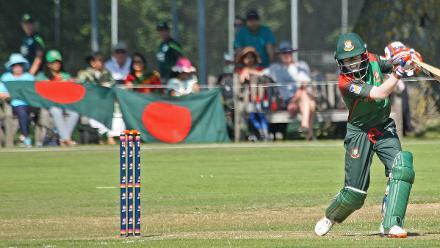 Ayasha Rathman is caught behind, 2nd Semi-Final: Bangladesh Women v Scotland Women, VRA Ground, 12th July 2018. 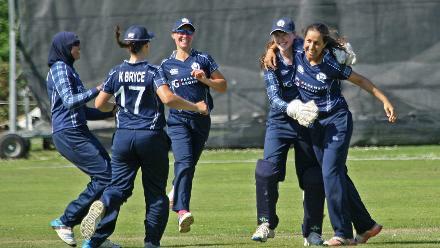 Big joy for the Scottish girls, 2nd Semi-Final: Bangladesh Women v Scotland Women, VRA Ground, 12th July 2018. 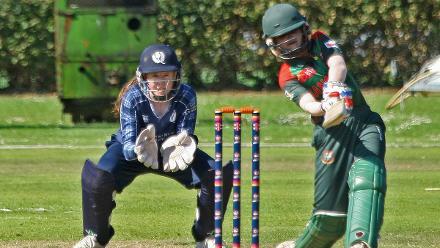 Nigar Sultana plays through gully, 2nd Semi-Final: Bangladesh Women v Scotland Women, VRA Ground, 12th July 2018. 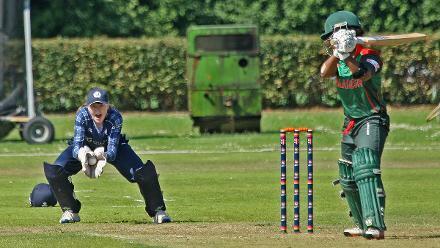 Pryianaz Chatterji coming in to bowl, 2nd Semi-Final: Bangladesh Women v Scotland Women, VRA Ground, 12th July 2018. 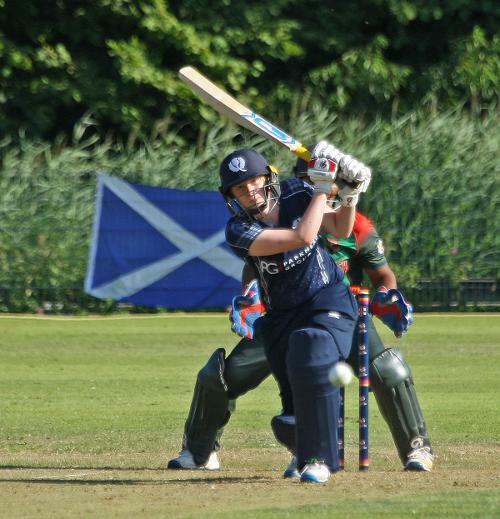 Sanijda Islam goes for the big one, 2nd Semi-Final: Bangladesh Women v Scotland Women, VRA Ground, 12th July 2018. 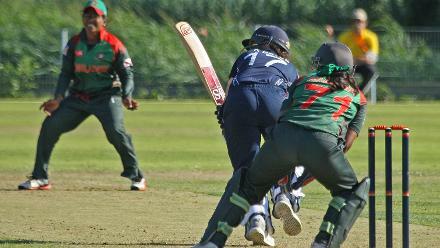 Sultana places the ball between three fielders, 2nd Semi-Final: Bangladesh Women v Scotland Women, VRA Ground, 12th July 2018. 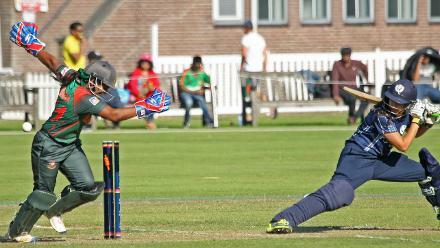 A wonderful save by Samin Sultana, 2nd Semi-Final: Bangladesh Women v Scotland Women, VRA Ground, 12th July 2018. 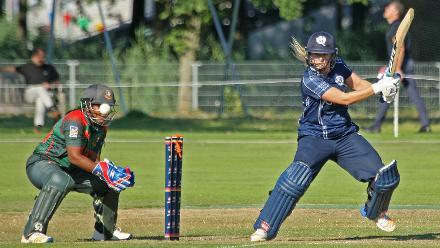 Abbie Aitken drives square, 2nd Semi-Final: Bangladesh Women v Scotland Women, VRA Ground, 12th July 2018. 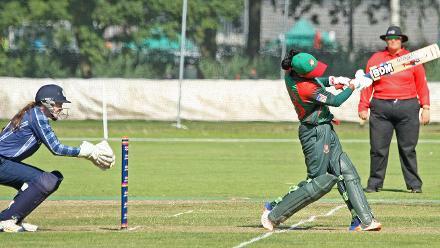 An unsuccessful appeal by keeper Shamima Sultana, 2nd Semi-Final: Bangladesh Women v Scotland Women, VRA Ground, 12th July 2018. 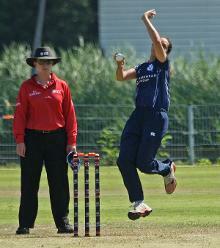 Katie Mc Gill bowled by Nahida Akter, 2nd Semi-Final: Bangladesh Women v Scotland Women, VRA Ground, 12th July 2018. 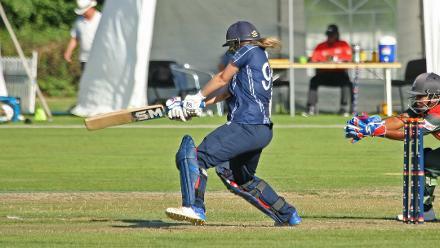 Katie McGill plays around her legs, 2nd Semi-Final: Bangladesh Women v Scotland Women, VRA Ground, 12th July 2018. Priyanaz Chatterji is bowled by Rumana Ahmed, 2nd Semi-Final: Bangladesh Women v Scotland Women, VRA Ground, 12th July 2018. 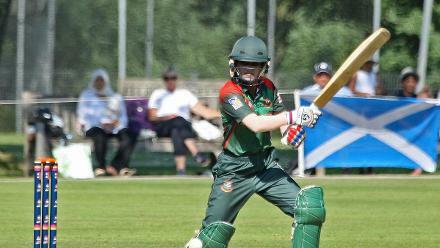 Tactically played to midwicket by Kathryn Bryce, 2nd Semi-Final: Bangladesh Women v Scotland Women, VRA Ground, 12th July 2018.